Capsicum rice is very simple to make lunch box recipe. We all love this rice very much. I make this weekly once for kids lunch box and for hubby's lunch box too. 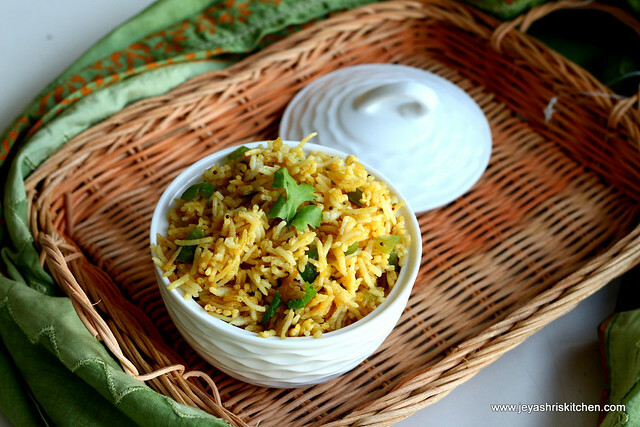 Try out this easy and quick lunch box capsicum rice recipe. Check out my full collection of easy lunch box recipes. Wash the rice and soak it in water for 15 mins. Cook the rice by adding 1 1/2 cups of water and half the salt. When it is done, spread it in a plate and allow it to cool completely. Heat a kadai and add the oil. Throw in the cumin seeds,when it splutters add ginger garlic paste. Throw in the chopped onions. Fry till golden brown . Add the Sambar powder, turmeric powder and salt to it and saute for a few minutes. Finally add the kitchen king masala and the chopped capsicums and mix well. After a minute, switch off the flame. Make sure the capsicum should not be overcooked. Gently mix the rice to it. Beautiful rice.. I too love this sooo much.. the capsicum flavor in it wow I simply love it. Lovely looking rice,very nice clicks! Will try soon! One of nice rice recipe from you...this looks delicious and nice pic..
thank u so much ladies.Thanks a lot for ur quick and encouraging comments. wow..the picture is so beautiful..so delicious..
Wat a beautiful and tempting rice, love capsicum in anything..awesome clicks Jeya..
Jayashree, wonderful click of ur creation. The rice looks very inviting. Thanks for this recipe. படிக்கும் போதே , உணவின் சுவையை உணரமுடிகிறது ..
very healthy recipe...beautifully presented dear. Looks spicy and delicious rice. Whata flavourful and delicious rice dish! looks so nice n yummy, dear! 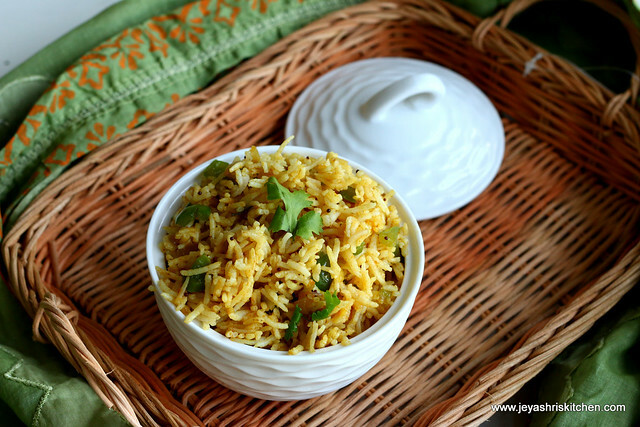 Flavorful n aromatic capsicum rice.I like it a lot jeyashri.Perfect for the lunch box dear.Inviting pic. capsicum rice looks so nice..nice clicks!! first time here...nice blog with wonderful collections of recipes...capsicum rice looks very colorful and delicious...liked the pics...gr8! Rice looks fantastic & perfect.. thxs for visiting my site & ur lovely comment dear..
Yummy rice :) looks really good and tempting :) I like the flavor of capsicum a lot. omg look at the rice how perfectly done it da.super dear.pls tell me which basmati brand u used? Capsicum rice looks so delicious what a simple one..really yummy sometime i prefer this so easy na. Hi jayashree, first time here. Loved your colorful capsicum rice, especially the green color popping here and here looks very nice. glad to follow you..
@pranis kitchen: i use ALQUILA brand basmathi rice and india gate brand also works out nice for me. This sure is a feast to both eyes and tongue :-) really beautiful ! capsicum rice ? Will it suit an old man's stomach? I dont know. But I really cant help but take a mouthful of it,as the occasion demands. Hmm..looks yumm.never tried a rice with capsicum..must try..awesome click..
wow..what a treat to my eyes!! beautiful rice..I make too, but never added sambar powder..sure to try!! I think I am the last one to comment on ur post. Adding Sambar pwd is something very new to me. It would have a nice aroma I suppose. I usually make fried rice in this manner only. But u have given an entirely new twist o this rice by adding sambar pwd and kitchen king masala, Sure I will try next time and will let u know. U have done a very good job and the rice has come out so well. Wonderful clicks too dear. Which brand Sambar pwd do u use?? Because i make my own sambar pwd. i have made capsicum rice 3-4 times...n i simply loved....its nice n easy to make.thanks a lot for the recipe...my family loves this rice. Hi.. tried capsicum rice.. came out very well.. thanks for publishing! Too good...! Tried this recipe...! Came out really well..! Thank you Jayashree....!